A zip-on bike cover, sure. Maybe even a zip-on saddle bag or zip-on helmet if you want to get a little kooky. But zip-on tires? 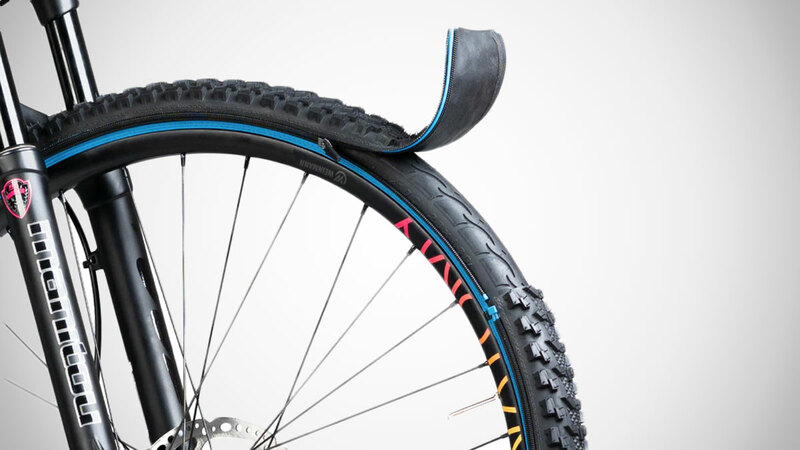 Like, reTyre ONE bicycle tire skins that physically zip on and zip off so you can swap out road for trail for all-terrain? To quote the great Brian Fellow: That's crazy! 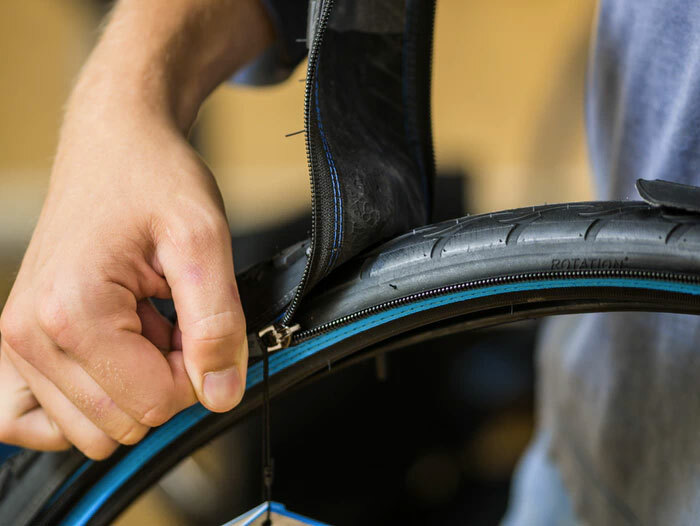 But sure enough, crazy could be coming to a bike near you courtesy of the reTyre ONE zip-on bicycle tire system. I say "could" because the modular skin system is currently in the crowdfunding stage and, while already fully funded, we'll just see if this idea mass produces and performs as advertised beyond reTyre's prototype tests. 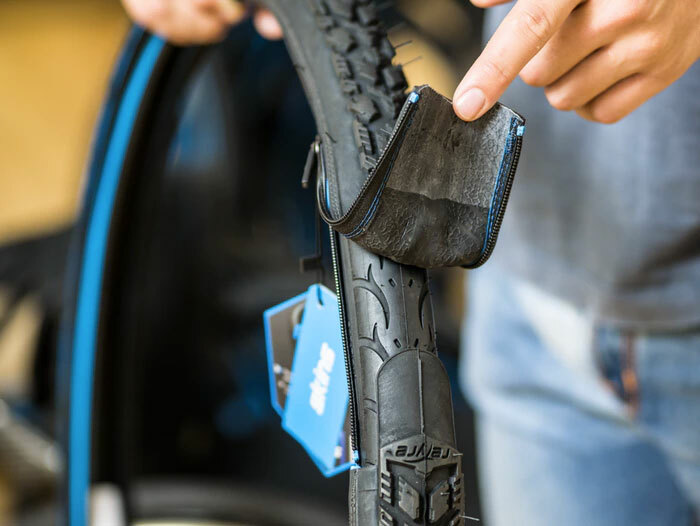 On paper, the reTyre ONE system functions like any other zippered item - you can add and remove various terrain-ready tire skins with a simple zipper securing them in place. No need to swap out the entire tire, or haul out your box of bike tools. the reTyre One requires 2 basic parts to function: 1) a full base tire with integrated sidewall zippers that mounts on a standard rim, and comes in 26", 27.5", 28", and 29" sizes; and 2) at least one reTyre Skin, an interchangeable cover constructed with a tread suitable for designated road or weather conditions. Proprietary Skins are designs to fit the base tire perfectly, so the overall system performs like a normal tire. But, but how can a tire with zipper teeth and pulls encircling and hanging off it perform like a normal tire? Does it not pick up a bunch of dirt and debris? Create weird inconsistencies in the tire? Cause major riding safety concerns? reTyre says they've out-designed all of your But, buts - again, with tested prototypes - and explains how throughout their Kickstarter campaign here. If you're interested in taking a chance on zip-on tires, get your reTyre ONE pledge in by October 26, 2018. Single-skin and 3-skin bundle packages are available.